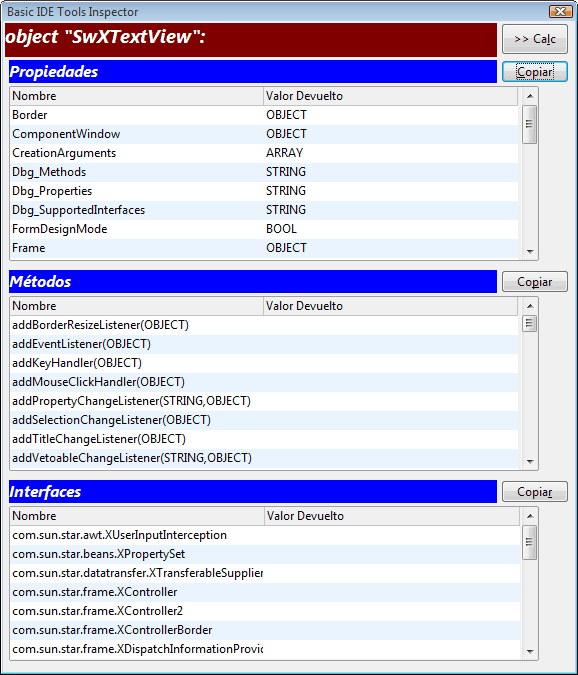 Extensiones -Basic IDE Tools : Tools and utilities for Basic IDE,. 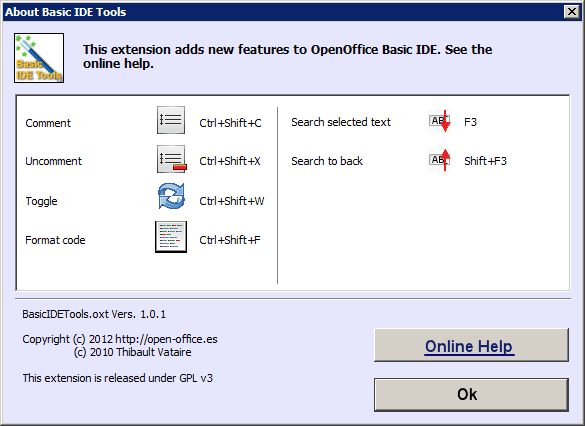 Basic IDE Tools is an extension for Apache OpenOffice and OpenOffice.org, developed by the open-office.es team, which adds a new toolbar to OpenOffice Basic editor (IDE). Includes several buttons that add new features and options that make working with macros and applications easier for the programmer when writing Basic code. The extension is released under the GNU GPLv3 license. Before using the extension, please read the terms of the license. 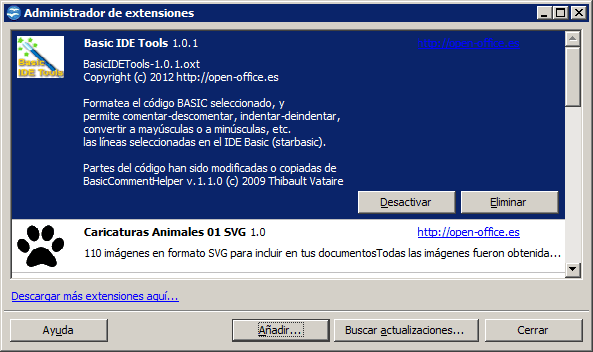 Basic IDE Tools is installed like any other extension of OpenOffice. If after requesting the extension download does not start automatically the extension manager, locate the installation file on your hard drive (BasicIDETools.1.0.1.zip or BasicIDETools.1.0.1.oxt) and double click itself, or from the context menu, select Open With ... OpenOffice.org. After requesting permission to install, and accept the license terms, the extension will be integrated in OpenOffice. 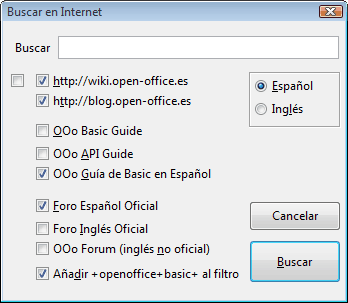 As for any extension, will have to close all open OpenOffice applications, including Quick Start (in spanish) so; after restarting OpenOffice, it is activated correctly. The Basic IDE Tools toolbar presents eleven buttons that add new options to OpenOffice Basic editor, and a About… button. This extension uses the text from the clipboard of the operating system to read the selected text, and after processing, replace the selected text with the text processing. Therefore operations do not copy, cut or paste in any application while the extension is performing any process. The text content of the clipboard before using any of your options is stored to be restored after making the selection. These three buttons, called Add comments, Remove comments and Toggle Comments allow comments, uncomment or alternate comments on selected lines of code. Toggle comments add comments to the lines that do not have, and remove comments on the lines that do have. These three buttons, called Indentation increase, Indentation decrease and Re-indent All, allow indent, de-indent or re-indent selected lines of the code. Re-indent option applies automatically indentation to all code selected by examining the code. All lines beginning with one of the keywords Private, Global, Public, Option, Sub, Function are placed at level zero (no indentation), as the lines that contain the keywords End Sub or End Function. All lines beginning with the keywords ', Rem, Dim will be indented to the level used by the previous line. The line following a line that begins with the keyword if, which contain the keyword Then after that word, and that contain code, will be indented to the same level, considering that it is an if then else endif on one line sentence. If the line ends with the keyword : (label) is indented to level zero. All spaces and tabs located at the end of lines processed will be removed. This button allows you to format the code of the selected lines, applying uniform criteria that improve the readability and visual appearance of the code. Used in conjunction with the option Re-indenting, allows to get a code with a clear and structured look. Press the keyboard shortcut Ctrl + Shift + F.
They read the names of the functions and subroutines in the format uppercase / lowercase as written on the declaration line of the function or subroutine. They read the names of the variables in the format uppercase / lowercase as written in the declaration line of the function or subroutine by declaring them as arguments, or after sentences Dim, Private, Public, Static or Global. They read the names of the constants in the format uppercase / lowercase as written by declaring then sentence Const. It replaces all Basic keywords for the same word formatted. For example, if' is replaced by If, select case by Select Case, msgbox by MsgBox, etc. Replace all variables that are found in the code after the place in which they are declared, just like then assignation to the name of the function at the point of its declaration, by the same word formatted as was declared. For example, if the function is declared as Function HelloWord, from that line, all calls to the function, such as Helloword or helloword are replaced by the HelloWord. Comment lines (with ' or rem) are not modified. Strings (all that is written in quotes ") are not modified. During the process shows a progress bar. Formatting takes time, depending on the number of selected lines and the length itself. Do not perform any action while applying the code formatting, as clicking on the code, or select another module, or any other action in the IDE; not copy, cut and / or paste into other applications. Wait until then process finishes. See at the bottom of this page Keywords recognized by the formatter. In order to apply format to the variables and constants in the selected code lines, the lines where it declares must also be selected, otherwise they will not be detected. That is why it is advisable to select all lines between Sub and End Sub or between Function and End Function, or better, select the entire module. In order to format the variables and constants in selected lines of code that have been declared at the module level, must also be selected the lines where they are declared. Otherwise, they won't detected. Therefore it is advisable to select the entire module. If a function or subroutine is called in the code before its declaration, it can't be identified by its statement format, and therefore, will not be replaced with the declared format. It is therefore necessary that the functions and subroutines are declared before use, although we know that this is not always possible. In future versions we are hoping to solve these three problems. These two buttons called Find Next and Find Previous let you search the selected text in the current module and in all then library modules. These two buttons called Uppercase and Lowercase allow to convert all uppercase or all lowercase, the selected code. 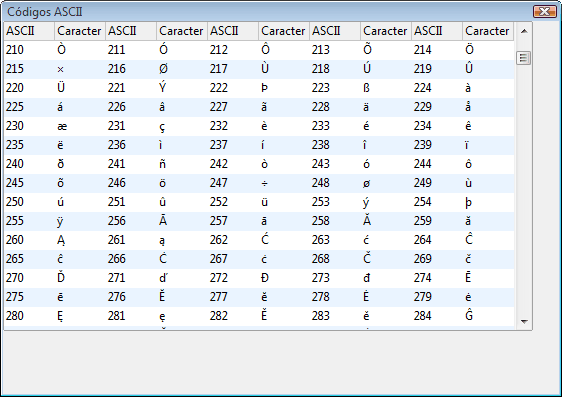 Presents a table of ASCII codes and corresponding characters. It has a wizard to write code. 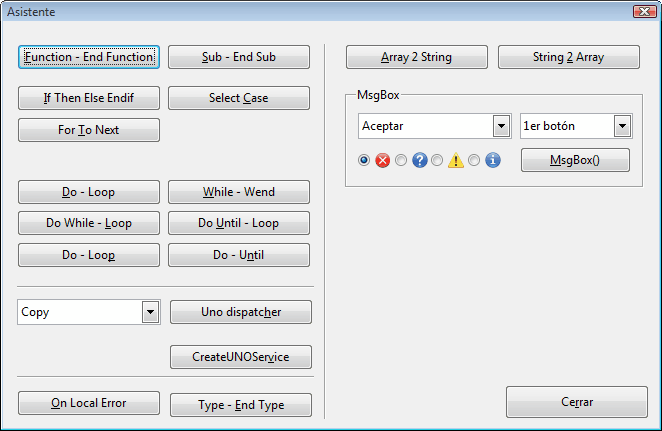 By selecting this option from the toolbar to display a dialog that allows you to insert predefined blocks of code, including Function, Sub, conditional IF and Select, loops For, Do, While, several blocks UNO dispatcher, On Local Error, definition of Type, functions Array2String and String2Array, and all variations of MsgBox. Enter code to call the object inspector. Use the >> Calc button to get a copy in a Calc sheet. Use the Copy button to paste the selected line to the clipboard. It has a wizard to get help on the Internet. You can edit the text to search, and select the sites where search using the options available. After clicking on the Search button will open your default Internet browser with a Google search restricted to selected websites. 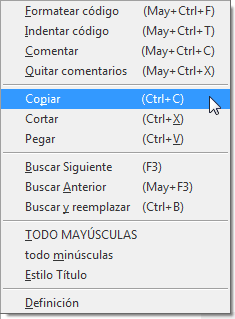 Activates a context menu in the IDE editor. This pair of buttons allow you to switch a PopUp menu that appears when you right-click in the Basic IDE editor. After clicking on the button 'Enable' of the toolbar shows this dialog, indicating PopUp menu is enabled. If you selected the call to a function or subroutine, clicking on the option Definition attempt to locate the code defining the same and if found, then display it on screen. The search is performed within the library that is being edited. After clicking on the button Disable of the toolbar shows this dialog, indicating that it has disabled the PopUp. When you close the Basic IDE editor ends with the utility, so it needs to be reactivated every time you start the editor. Presents information about the Basic IDE Tools extension. You can use the Undo button on the Standard toolbar of the IDE, or the keyboard shortcut Ctrl + Z to undo the changes made to the selected code. We observed that the IDE undo button usually fail when trying to undo several steps. This error is not due to Basic IDE Tools. In our trials, the first step to undo has always been made without error, and we consider not secure to undo more steps. Back up your code before using this software. Save the changes to your code always before using this software. It has been done trials simulating errors. After saving the project, it has been added an option with a simulated error thath ruins the code. Then we closed the IDE editor without saving changes, after reloading the project, we recovered without problems the saved code before applying the option. It is therefore recommended that you always save the changes before applying a command available in the extension. In the case of noticing that after applying a command for extension in its code has been wasted, you can follow the same procedure as described in the previous paragraph to attempt to retrieve the previously stored code. Software that is the extension and any associated components are distributed in the hope that it will be useful, AS IS and WITHOUT ANY GUARANTEE of its performance, fitness for a particular purpose, or of the results obtained. If you use this extension, is at your own risk. We are not responsible for any damage or loss that may lead to the use of this software. By installing and / or using this software implies your acceptance of the terms of the GNU GPLv3 license that must enclose the software. Please refer to the GNU General Public License for more detailed information. The words recognized by the formatter are presented in the table below these lines. The formatter will replace any occurrence of these words in the code written by the same word with the same look as that presented in the table. They are presented in alphabetical order from left to right in each row, and up and down columns.